"Yesterday Deputy Zach Ropos was on patrol yesterday and stopped by a little girl’s lemonade stand to make a purchase. He asked the little girl named Gabrielle what she was going to do with all her money. She explained that she wanted to buy an IPad so she could play games on it and go on the Internet for school. She knew her family was having a very difficult time financially and she knew that she would have to work hard this summer selling lemonade to get enough to buy one on her own. Deputy Ropos went home after shift to find an I-Pad he had that was an older model. He wanted to give it to her. When he found out it didn’t work he went out last night and bought her a new one on his own. Today Deputy Ropos presented Gabrielle with her very own computer tablet. The gift became even more valuable when Gabrielle’s mother told him that just before he arrived Gabrielle offered to give all of her lemonade money to her mom to buy gas for the car! I am sure he will be embarrassed to hear this highlighted and that it was never his intention to get recognized. 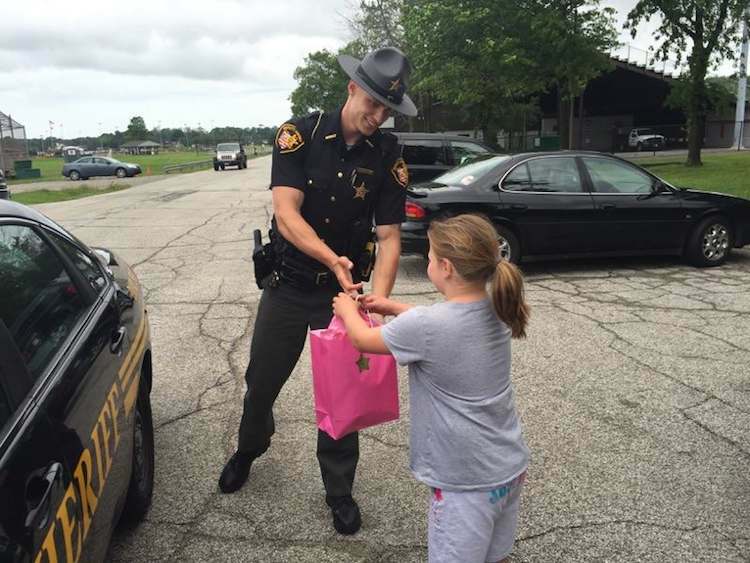 But great job Deputy Ropos on making this little girl’s day! You really make a difference. And all of the best to Gabrielle and her new I-Pad. Chief Deputy Frank Leonbruno" - All words via the Lake County Sheriff's Office.